Comedy rarely takes blacker form than it does in George F. Walker's Dead Metaphor. At the same time, the pursuit of laughs rarely takes more timely, absurd and hilarious form than it does in this world premiere being staged by American Conservatory Theater. The play skewers such conventional targets as amoral politicians, hypocritical religionists and marriages of mismatched couples, but goes well beyond that in exploring the plight of a young veteran who has returned from Afghanistan and found an American environment filled with perpetual traumatic stress. Physically and psychologically, veteran Dean Trusk has emerged unscarred by war; among the play's six characters, he's the most normal and likeable. But he doesn't have a clue about how to function in in a civilian world that is rife with competition and ferocious ideological conflict, and the personalities who represent that world don't have a clue about how to find a meaningful and satisfying place for him. This being black comedy, Dean's military specialty did little to prepare him for the civilian life that will follow. He served as a sniper, executing his duty -- and far-away victims -- with precision and without regret. Their business was to kill him and his buddies; his business was to kill them. That's not a very marketable skill, or so it seems until Walker's high-key craziness really gets rolling. Despite his experience at politically justified homicide, Dean's salient trait is innocence, wonderfully embodied in George Hampe's performance; among other concerns, he doesn't have the foggiest idea of how to sell himself in a job interview, even though it's conducted by sympathetic social worker Oliver Denny (a delightfully droll Anthony Fusco). When Dean finally does land a job, it is as a flunky for Oliver's determined and ambitious wife, Helen, a politician who might inspire recollections of MIchelle Bachman or Sarah Palin. Attired in tailored suits and perfectly coiffed, ACT regular René Augesen radiates assurance with every word and gesture. But she makes one admission that we never hear from political pros: that the positions she affirms so forcefully are not necessarily hers. They reflect what she believes stupid voters want to hear. Although it's clear that Walker's sympathies lie leftward, he balances Helen's right-wing demagoguery with populist tirades from Dean's father, Hank, whose rants reveal both his beliefs and his socioeconomic roots. Helen sips martinis; she delivers her putdowns -- usually directed at husband Oliver -- in measured cadences; Hank Trusk (a robust turn by Tom Bloom) goes for burgers and beer; he barks and bellows hostility in many directions, sometimes rationally, sometimes not. But Hank balances Helen in still another way, as a partner in another odd-couple marriage. 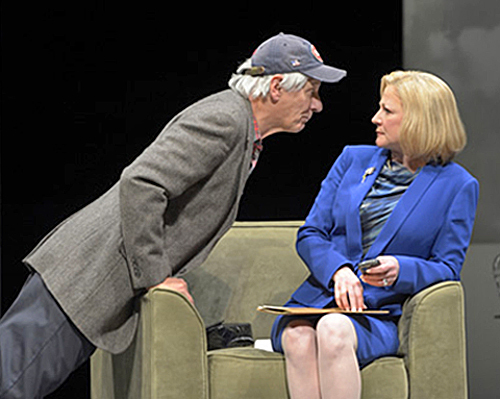 His gruff demeanor -- partly attributable to a brain tumor -- and religious skepticism find their opposite in his gentle, sincerely pious wife Frannie (Sharon Lockwood). Their doctrinal views and conflicts surface in a beautifully rendered, wildly funny scene of prayer and disruptive fury in a presumably Catholic church. Not to be outdone in domestic dissension and bliss, Dean is also married. He has tied the knot twice, to the same loving but independent woman, Jenny (Rebekah Brockman). She divorced Dean when he joined the military, to escape the prospect of becoming a war widow. When he returned, they remarried and eventually became partners in a bizarre scheme to escape poverty through the use of his military skills. The scheme stretches belief beyond the reasonable exaggerations of satire, but it hits the right buttons of hilarity, and ultimately of pathos. Irene Lewis directed the brisk proceedings, in which short scene flows into short scene on a series of concentric, revolving rings: a target in black and white designed by Christopher Barreca. Walker has been one of Canada's leading playwrights since the '70s, most notably as the creator of dark comedies. Dead Metaphor brings him to San Francisco in stunning form. 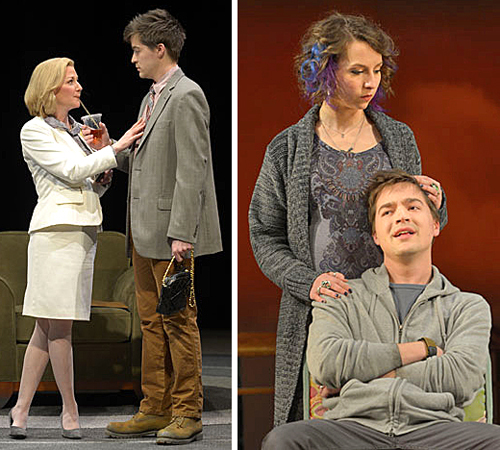 Dead Metaphor runs through March 24 at American Conservatory Theater, 415 Geary St., San Francisco. Tickets are $20-$95, from 415-749-2228 or www.act-sf.org.